The meeting on the first information obtained from the "RELEC" instrument. Photo by Oleg Barinov. 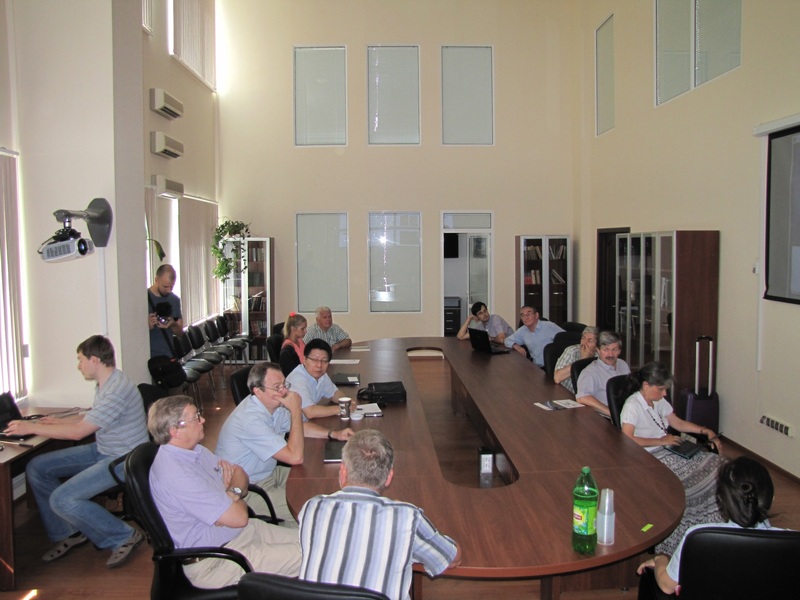 A meeting, where the first data obtained from the "RELEC" instrument was discussed took place in SINP MSU on July 28 and 29. The scientists and engineers from the Lavochkin Scientific and Production Association, Space Research Institute, Control mission Center of NILAKT DOSAAF (Kaluga), Hungarian, Polish, Korean and American universities and scientific centers took part in it. Scientific instrument "RELEC" (Relativistic ELECtrons) is a complex of equipment mounted onboard a small spacecraft MKA-FKI N2 manufactured by Lavochkin Scientific and Production Association on the base of a standardized platform "Karat". The total mass of the spacecraft is 283 kg, payload mass is 41 kg. The objective of the "RELEC" experiment is to study the high-altitude electric discharges, atmospheric transients and precipitation of the relativistic electrons from the Earth's radiation belts. The first contact with the spacecraft was made on July 8, at 21:30 MLT. On July 16 at 17:38 UTC the "RELEC" complex of scientific instruments was switched on for the first time. Coupling of the spacecraft and the "RELEC" instrument is operational. Besides, the elements of the "RELEC" orbit were determined: its perigee is 600 km, apogee - 800 km, inclination - 99 degrees, sideral period is 1 hour 40 minutes. Antenna of the first instrument - radio-frequency analyzer of the electromagnetic field and radio-waves (RChA) manufactured in Poland - was successfully released on July 18, at 16:40 UTC. Antennas were released at the end of the solar part of the orbit. The instrument accumulated data during 10-minutes long period before the release and during 50-minutes long period after it. About 20 MBytes of data was obtained for the time period from 16:30:00 up to 17:29:59. Then all other instruments of the "RELEC" complex were switched on for 1.5 hours. The first information from many instruments have been already analyzed and the first resuts were presented at the meeting. Hanna Rothkaehl from the Polish Academy of Sciences told our correspondent: "We got the first results. And we are very glad that antennas were released successfully. We produced very light antennas, their total weight is 30 g. We observed electromagnetic waves in the ionosphere. Time resolution of our instrument RChA is 25 nanoseconds. The instrument is intended for the studies of radio-waves in the near-Earth space. Basing on the obtained information we'll have a possibility to separate radiation produced by the Sun from the radiation produced by the thunderstorms and poduced by the earthquakes. For instance, we'll be able to forecase earthquakes." "Our telescope is intended for the observation of the light flashes in the upper atmosphere. These days we obtained data from MSU and recognized the events interesting for the future studies. The instrument is operated. Similar equipment was mounted onboard the "Tatiana-2" satellite in 2009. Now we have improved it: we used new mirrors onboard "RELEC", so the obtained information should be more accurate," - Professor Il Park, the Head of the Korean scientific space program told us. Optical part and electronics of the instrument Telescope-T within the "RELEC" complex was developed and manufactured by his team. It is an optical instrument intended for the imaging of the flash region - high-altitude electromagnetic discharge. Ilan Rot from the Berkley University told about his interest in the results of the "RELEC" experiment: ""RELEC" measures the same inreases of the relativistic electrons as the American satellites "Van Allen", with which I'm working. So this information is very interesting for me. I'd like to compare "RELEC" and "Van Allen" data. First of all, I'd like to evaluate the information quality. Besides, altitude of the "Van Allen" orbit is several thousands kilometers, while "RELEC" orbit is only at 800 km. Balloons fly at the lower altitudes, so it will be very interesting to analyze the same event comparing the data obtained by "Van Allen", "RELEC" and balloons in order to understand which theory is correct."